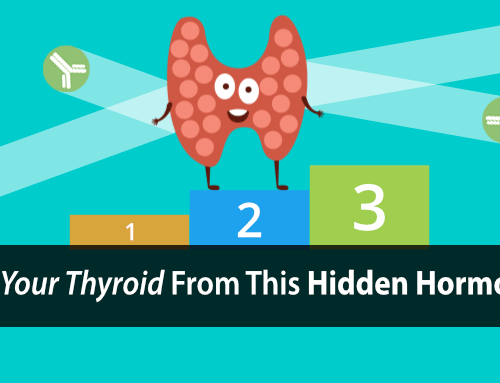 We talk a lot about how hypothyroidism creates various hormonal imbalances in your body. And, how those hormonal imbalances perpetuate your hypothyroidism. …even in your fruits and vegetables. That’s right, the food you consume can directly contribute to your hormone levels and affect your thyroid function. That’s why you need to minimize or eliminate the six “high-serotonin” fruits that I’m going to share with you in just a second. But, before I do, it’s important you understand why serotonin is dangerous, especially for thyroid sufferers. You might have heard about serotonin from watching commercials for antidepressant drugs or through deeply misinformed health advice. 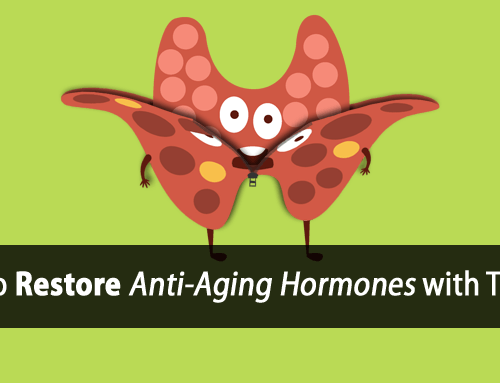 It’s often referred to as “the happy hormone” but the truth is actually quite the opposite. So why is serotonin advertised this way? For decades now, companies have been making these claims to market “selective serotonin reuptake inhibitor” (SSRI) antidepressant drugs that have, at best, an unclear track record, and have also made those companies billions of dollars in profit. Yet, the supposed connection between low serotonin levels and depression has never been made. …because hypothyroidism is known to promote the overproduction of serotonin. Thyroid hormone control of serotonin in developing rat brain. Instead, people who have hypothyroidism often experience terrible stress and anxiety. This is because serotonin, in reality, is an innate stress hormone that triggers the “fight or flight” response in the brain, which is a natural, involuntary response meant to save us from mortal danger. In addition, serotonin is well known for suppressing thyroid function too. As mentioned above, thyroid sufferers commonly overproduce serotonin. …unsurprisingly, all of which suppress thyroid function. 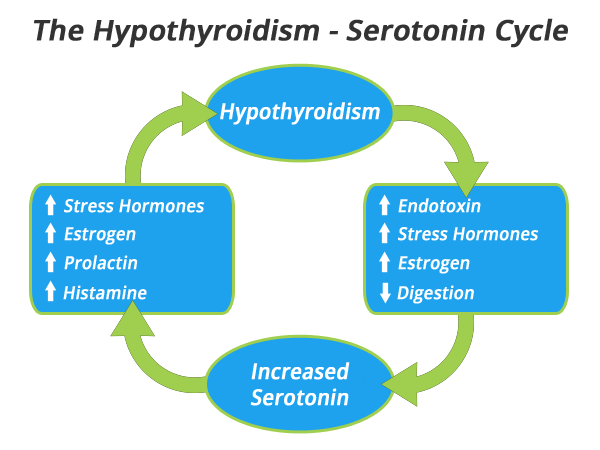 This promotes something I call the Hypothyroidism-Serotonin Cycle, which can trap you in a state of hypothyroidism. Fortunately, we can break this cycle and help restore normal thyroid function at the same time. We can do this in part by decreasing serotonin levels. Avoiding foods that naturally contain larger amounts of serotonin can certainly help. While fruits are certainly an important source of thyroid-boosting nutrients in our diet, not all fruits are created equal. In fact, there are several fruits that contain very high levels of serotonin. You might be surprised by some of the fruits on this list, because they are considered to be extremely healthy, even referred to as “superfoods” by many diet websites. 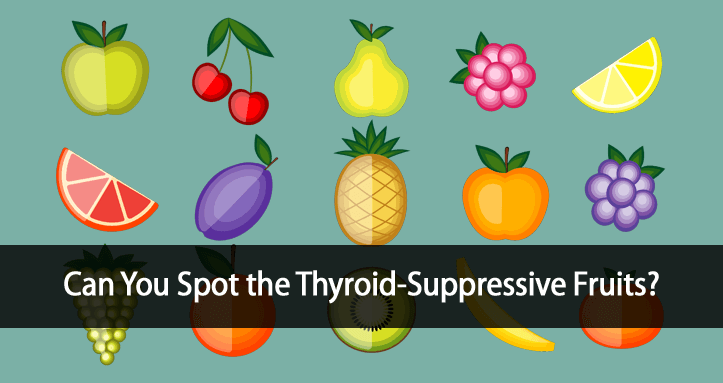 And while it’s true that these fruits contain important nutrients, I can assure you that you can find those nutrients in other fruits that are thyroid-supportive instead of thyroid-suppressive. I’ve said it before, “It’s the dose that makes the poison,” and these 6 fruits have the highest levels of serotonin. So what can we do about serotonin’s negative influence on our thyroid health and general wellbeing? We need to stop it at the source. We must decrease—or eliminate entirely— these high-serotonin fruits from our diet, as well as balancing our intake of tryptophan, the chemical the body uses to make serotonin. In addition, we need to add thyroid-supportive foods to our diet that can help control the amount of serotonin produced in the body. Fruits are important to supporting thyroid health. It’s just important to focus on the right fruits rather than the wrong ones. It includes one fruit that can help reduce serotonin and its effects on the body while boosting thyroid function. 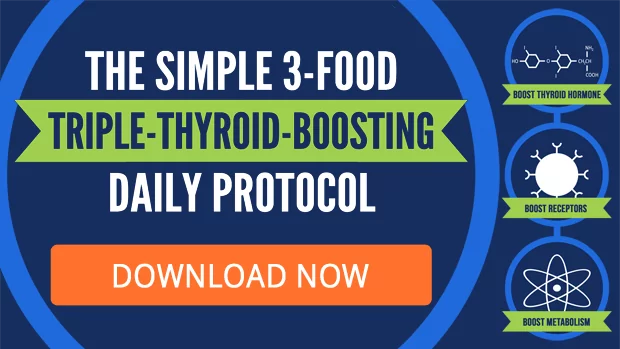 You can use this protocol to enhance your diet and your thyroid health so that you can feel better, reduce anxiety caused by hypothyroidism, and get back to the life you want to live. How do you normalize thyroid medication to stop hair fall out ? I see tomatoes on the list snd I use them in my meals quite frequently rather it be a caprese salad, diced tomatoes in a bean free chili, or tomato sauce in my spaghetti. Should I be limiting the amount of meal I plan each week with tomatoes and of so, to how many? They can still be used, but they should be limited. If you use them in most meals, that’s probably too much if one is hypothyroid. I find this very interesting. I take SSI anti depressants. Have done for 35 years. Mine is not a dangerous depression. I cried a lot and also lash out verbally to people. I have the trilogy of high blood sugar, blood pressure and lipids. My hair is thinning, have IBS, over weight and muscle pain. this could be the connection? I have no thyroid function and take both kinds of supplements. My experience in working with clients on SSRI’s, is that the SRRI’s strongly active the body’s stress response which can both suppress TSH and artificially elevate body temperature making it falsely appear that thyroid function is much better (or even normal) than it really is. However, this is further suppressing thyroid function at the same time. 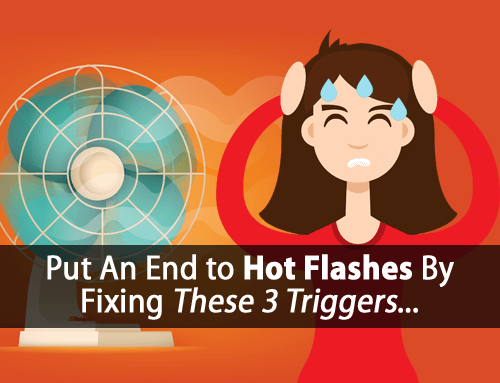 Because of these effects on TSH and body temperature they can actually feel physically better when on the medication, which is why they often feel worse when they stop. So, we have to compensate by stimulating metabolism to help drive body temperature back up so they feel normal again. What about peaches? Always was thinking it’s thyroid suppressive. Keep in mind that you have to consider all effects of a food/fruit, good and bad. With highly goitrogenic foods such as broccoli/cruciferous, there’s really no benefit and there are additional thyroid-suppressive components. With peaches being slightly goitrogenic, there are additional benefits that outweigh the concern. However, if one was severely hypothyroid and had access to other fruit sources, then using lots of peaches in their diet may not be the best option. Please forgive my question being posted on this public forum, but I am wondering if I am interpreting the statement in the pubmed link you gave us. At the end of the summary it states. “Ingestion of these fruits and nuts resulted in an increase in urinary 5-hydroxyindoleacetic acid excretion with no change in platelet serotonin concentration. The above foods should not be eaten while a urine is being collected for 5-hydroxyindoleacetic acid analysis”. The only thing this study looked at was how foods would affect the blood test for 5-hydroxyindoleacetic acid and that they also found that eating those foods did not increase or increase platelet serotonin concentrations. So, it seems like they are saying the foods did not increase serotonin in the blood, but instead increased 5-hydroxyindoleacetic acid which is a transporter of serotonin. What I didn’t have time to look into is whether an increase in 5-hydroxyindoleacetic acid would be beneficial (it is transporting serotonin out of the body) or whether it is not beneficial (it’s an indication of increased serotonin levels – although this study found that was not the case, their study was very limited). I trust you are more well-versed that I am in body chemistry and look forward to your input on this. That’s a good question and for the sake of simplicity, I didn’t cover this detail in the article. But I’m happy to provide additional details. Sorry if this gets a little too technical. Keep in mind that the study used “healthy” subjects rather than hypothyroid subjects. In the study they measured 5-hydroxyindoleacetic acid (5-HIAA) levels after consumption of the high-serotonin fruits. 5-HIAA is the main metabolite of serotonin, and increased urinary excretion is simply a sign of how much serotonin the body is breaking down or excreting. Increased extretion is an indicator of elevated serotonin levels. In the study they also measured platelet serotonin levels which did not change. This suggests that the “healthy” subjects broke down and extreated the excess serotonin. However, there are some big concerns that are not covered. First, to accurately measure blood serotonin, you have to measure whole blood serotonin. This includes both platelet serotonin (bound) and plasma (free) serotonin. When serotonin is bound by platelets it’s not harmful and tends to be readily excreted. It’s the free serotonin that is extremely dangerous. 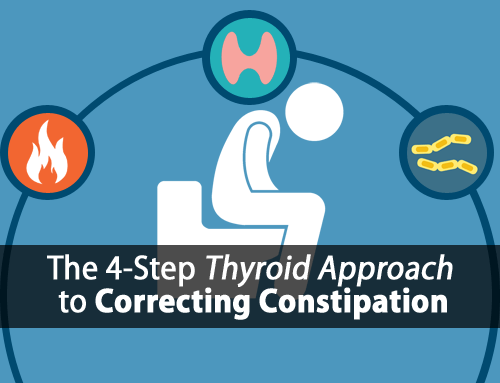 Second, this is much more complicated for hypothyroid sufferers. As mentioned in the article, hypothyroidism itself increases serotonin levels. And the consumption of high-serotonin fruits will in fact increase serotonin levels further. Yet, the important thing to note is that hypothyroidism causes carbon dioxide (CO2) to be readily lost. And low/decreasing CO2 levels cause serotonin to be released by the platelets, increasing free plasma concentrations, which is very dangerous. So, in a nutshell, if one is healthy (not hypothyroid) then the excess serotonin from foods may well be bound to platelets and excreted, although we don’t know because the study didn’t measure free plasma serotonin. However, in hypothyroidism, serotonin is already in excess with a higher percentage being “free” and very dangerous. Adding additional serotonin from foods or any other source will tend to further increase free serotonin, thus increasing its dangerous and thyroid-suppressive effects. Wow. I don’t always read these, get so many newsletters, but so glad I read this one today. Usually eat a banana daily, just ate several kiwis (on sale), just bought pineapple after reading the enzymes are good for digestion. Reset time! So this is a different issue from foods being goitrogenic? Can you point me to a link that tells me about goitrogenic fruits or vegetables so I understand the difference? Do you think this would still have any affect on the thyroid? I’m not well-versed in this field. I didn’t cover the study in the article for simplicity sake, because to explain it would be require a lot of technical detail. However, I did address this in detail in response to Diane’s comment above. 5-hydroxyindoleacetic acid = 5-HIAA and is not the same as 5-HTP. I thought the fiber was really healthy. 12 g of fiber in a serving. Can you provide some biochemical Pathway on how serotonin increases estrogen? I do eat bananas on my oatmeal and tomatoes in salad and spaghetti sauce. I love tomatoes – crazy for them – and that probably has something to do with the seratonin. I don’t eat the other fruits. But, it’s just food and diets can be adjusted in order to reach the real goal: feel great every day.